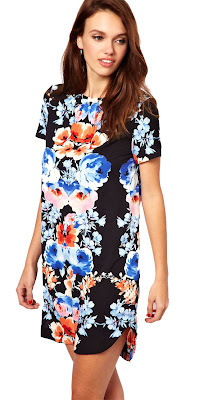 Have yall seen the new arrivals at Jules Reid? I am smitten with the Teddy Kaftan. I mean, how would one go about picking a color? They are all so pretty. It makes me want. to. type. in. annoying. blogger. type. Take note: Camera bag suitable to tote around Paris and Italy without looking like a tourist. I will be saving my pennies for one of these. 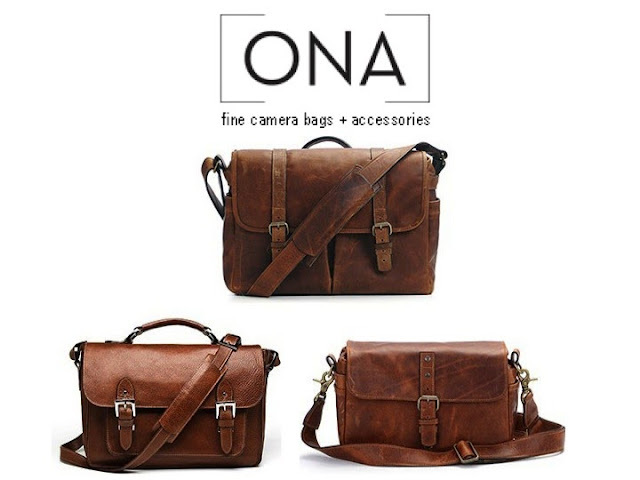 Finding a good looking camera bag is not easy task. I am really loving these ONA bags. *This is not a sponsored post, even though it kind of looks like it. If someone out there wants to give me one it could be sponsored. This weekend I went home to watch a very old friend get married. I had so much fun I forgot to take pictures. While I was home I was able to do a little shopping. I am from a little town called Morganton that is in western North Carolina. We are just close enough to Hickory to have tons of local furniture spots. My favorite stop is B&S Furniture. They have tons of samples pieces from big name designers and they make their own furniture. This was where I found my tortoise coffee table. Our next stop was Dale's Antiques, there are actually three different locations. Most of the stuff is not actually antique. It appears to be more new furniture, either surplus or samples. They have a lot of pieces from Horchow/Neiman Marcus at crazy prices. I found this Lilly Pulitzer chair for $35, which is insane. There was only one which explains the low price. On the way home we ran into multiple thunder storms. Hank is not a fan of storms. Before I knew it he had climbed over everything and I had to ride home with a 75lb. pup trembling in my lap. I am finally done with my master bedroom for now. I came across this vintage painting for $20 and thought it would add the perfect amount of color and quirk in our bedroom. We are packing our bags and heading to Paris in September. Doug's brother is getting married in Italy and we wanted to make a quick stop in Paris before we started the wedding festivities. One of my favorite things about this weird little blog is that I get to "meet" so many different people with different experiences. On all of our travels, I have taken recommendations from readers and it has been amazing. So here we are again, I ask you pretty please to share with me your favorites. 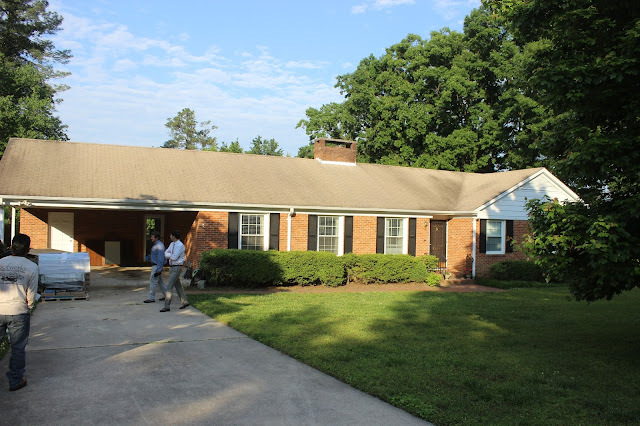 This weekend my friend Rachel hosted some girls at her parents house in Wilmington. I have not been there in years. The summer after my freshman year in college I rented an apartment in the beachy town with two friends. We got waitressing jobs and slept on air mattresses. Things have changed so much since that summer. 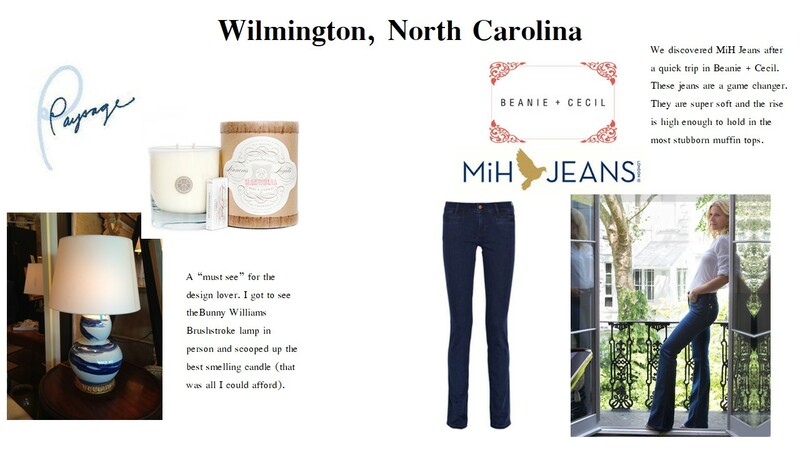 Wilmington is jam packed with cute shops and good eats. 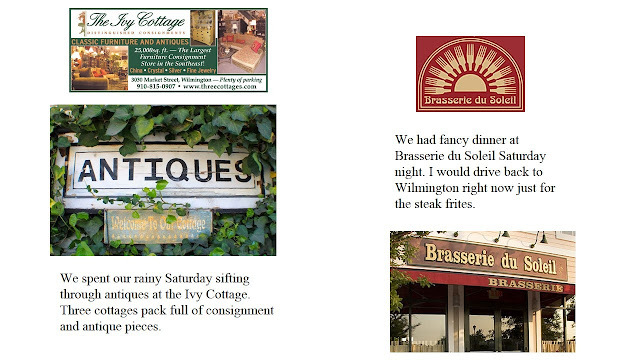 Some of my favorite places included Paysage, Beanie + Cecil, The Ivy Cottage and Brasserie du Soleil. Today... I am not a damn Tucan. Thanks for making my day CS. I am so bad about sharing projects. One huge project has been checked off the list. 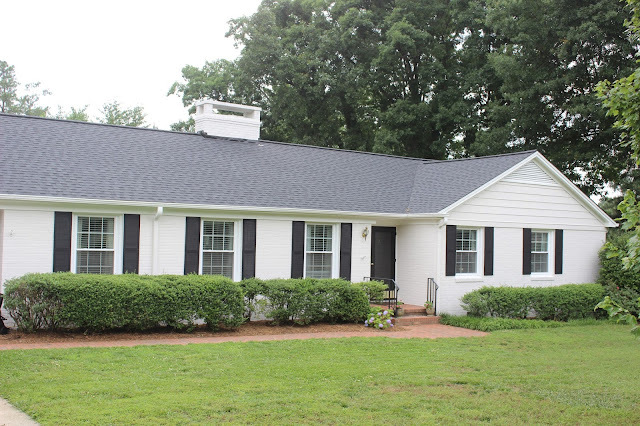 We finally painted our house and got a new roof. We are still in the process of doing some landscaping, replacing the railing and getting some larger shutters. I actually ended up asking neighbors for paint colors. They had paired their brick with a light shutter which was my initial plan. 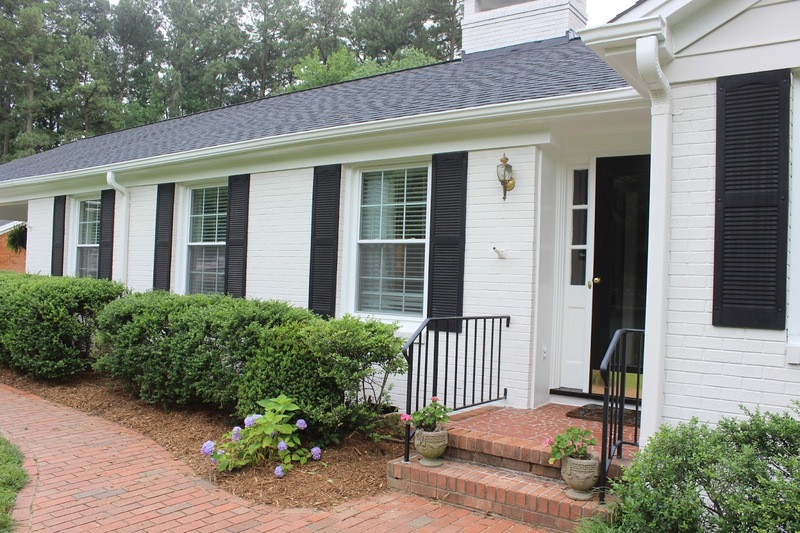 After we decided on the same color as someone close to us I figured I would keep it different with a classic black shutter. The great thing about picking a neutral white/off white is you can change the colors of your shutters to give you an update whenever you are getting tired of your paint combos. Paint is cheaper than a new house. My favorite blog/real life friend is hosting a little girls weekend at the beach. I am praying this tropical storm does not wash us away. -My favorite designer, Rebecca Taylor is having a sale on top of sale. Extra 40% off. - I want to go to this dinner party. - This is my new favorite website for at home workouts. I am sore the next day without having to go to the gym. Word. 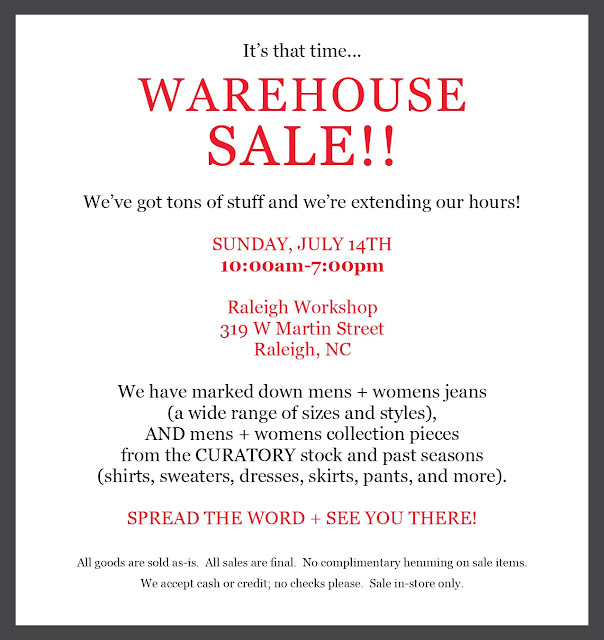 -Do not forget about the Raleigh Denim Warehouse Sale going on this weekend. Bloggers love it, non-bloggers not so much. I was talking to one of my good friends and she said she just cannot get down with it. The website itself can be overwhelming and the thought of ordering outside of the U.S. feels sketchy. 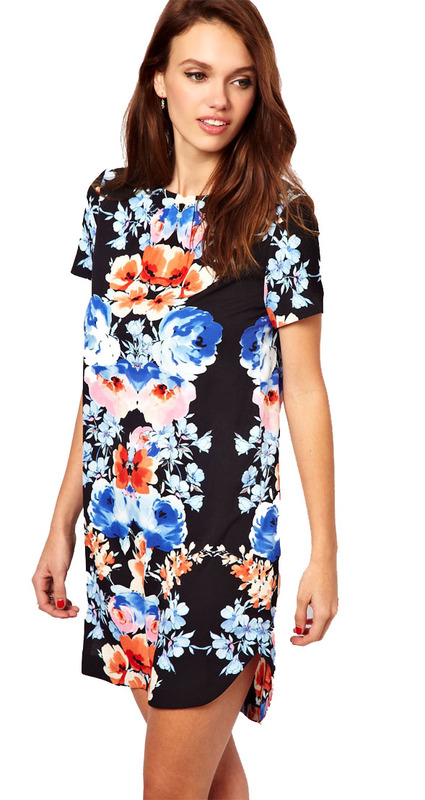 smock, swing or shift dress and get straight to the point. Any other tricks for sorting through the never-ending pages of junk? I have been dying to own a pair of Raleigh Denim. Word on the street, they turn into all sorts of amazing the more you wear them. 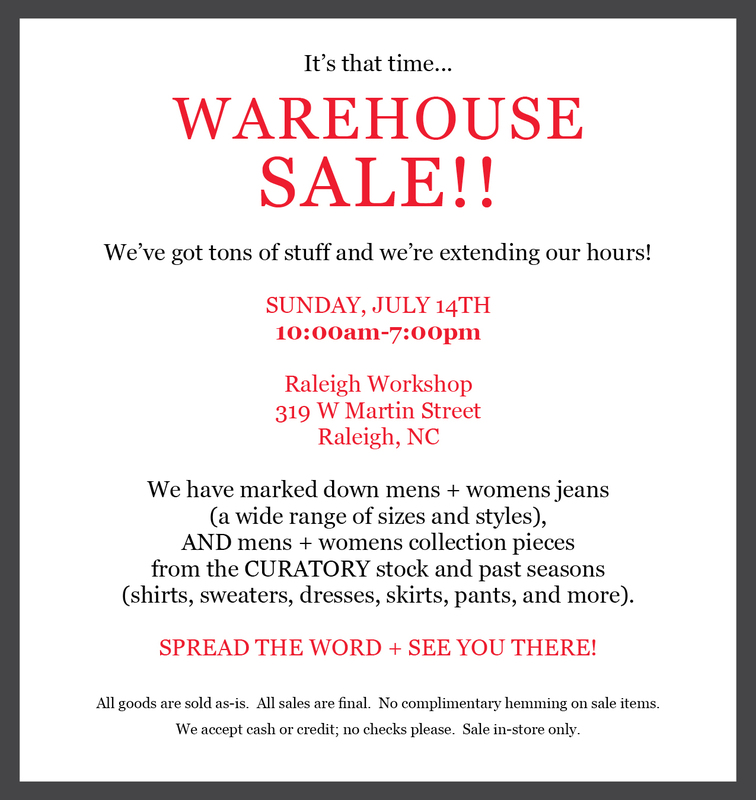 If you are in town this weekend they are having a huge warehouse sale. I have a feeling you better get there early. My favorite purchase of summer. A festive cake made by a favorite friend. Exploring a new little town on the coast. Organizing my blue and white collection. Flea market finds mixed with good china. I am having a hard time wrapping my head around this. 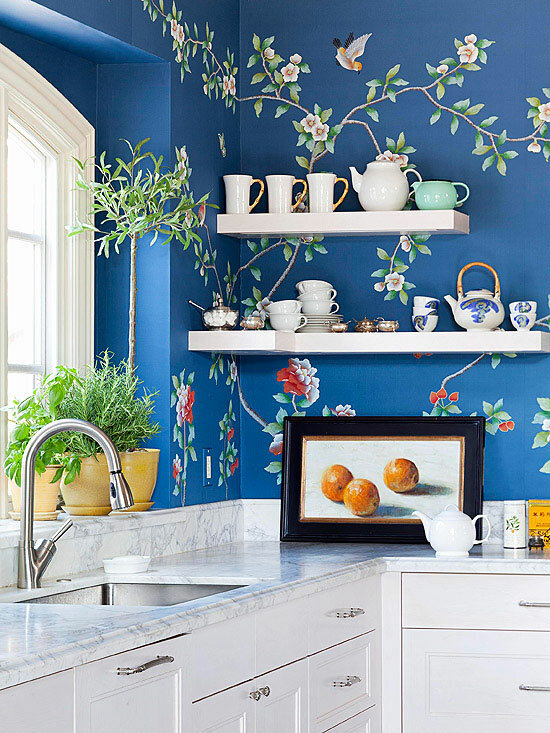 It might be the most perfect shade of chintzy wallpaper I have ever seen. Speaking of chintz, you should check out this article haters. My dream is coming true. The day you can sit on your big floral sofa and not be judged. I am on a mission to get my life together. I have never claimed to be an organized person. I am more of a stuff it in a closet and shut the door type. Our house is old, which means we do not have a lot of square footage and closet space is at a minimum. My friend is helping me organize my closet (more on that later) and it has given me the bug to maximize the space we do have. Here are some of my favorite ideas. Labeling shoes using Polaroid pictures. 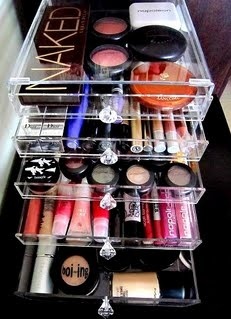 This acrylic chest from The Container Store is a great way to organize make up or jewelry. 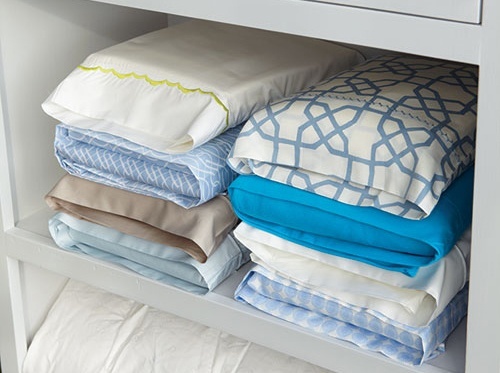 Use pillow cases to organize sheet sets and keep things look neat in your linen closet. 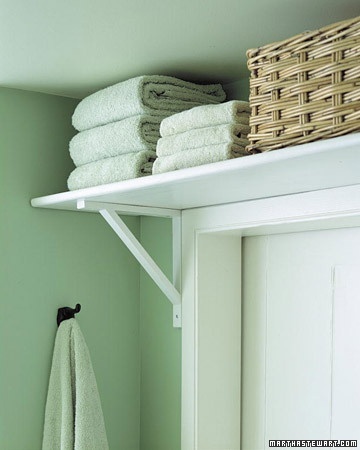 Add a shelf over a bathroom door to maximize storage in small spaces. 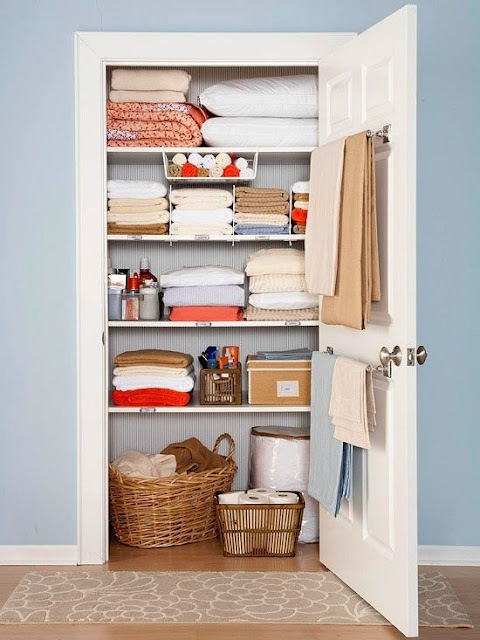 I love the idea of towel hangers inside the closet. Perfect to hang blankets or even pressed table cloths. Never hurts to find projects around the house that are inexpensive and make your life easier.